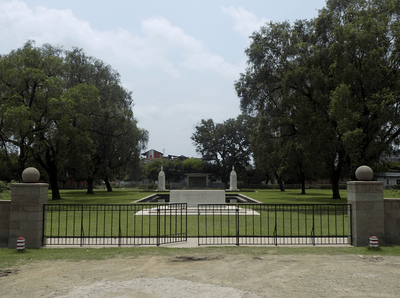 Imphal is the capital of Manipur State, which is in Northeast India and borders on Upper Burma (Myanmar). The cemetery lies 10 km from the airport on the far side of town. It can be reached from the town centre by following the Sanjenthong road for 1.5 km, then turning left on to the New Checkon road for another 1.5 km before approaching Highway 39. Some 50 metres from the highway turn right on to Masjid Road, Hafiz Hafta. The cemetery is at the end of this road. 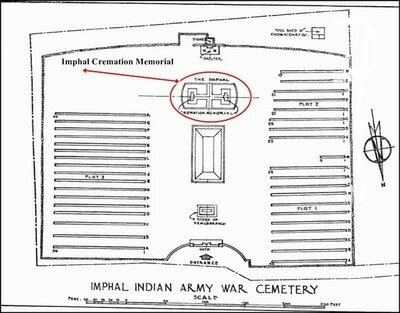 Imphal Indian Army War Cemetery is open every day between 09:00-16:30 (March-September) and 09:00-16:00 (October-February). Disabled access is through main entrance gates. The easiest route from Burma (now Myanmar) to India is through Imphal into Assam and after the invasion of Burma, Imphal became a focal point in the defence of India against the Japanese. Early in 1942, as the Japanese approached Rangoon, a very large proportion of its Indian population fled from the city to India, many of them to Upper Burma and so by Chindwin tracks to Assam. In May of that year, Commonwealth forces followed the same route on their retreat to India. In their wake came still more civilian refugees, many of whom died on the arduous journey under ceaseless heavy rain, without transport and food. Of the 400,000 civilians who fled to India about 140,000 passed through Imphal into Assam. The defence of India and the retention of a position from which Burma could be re-entered now became of primary importance. The 23rd Indian Division was formed in Manipur State, new airfields were constructed there, and army and air force reinforcements arrived. Eventually there was a considerable concentration of Commonwealth fighting forces in the Imphal area and from November 1944 onwards, No. 38 General Hospital was posted there. Strategically well placed for attacks on the lines of communication by railway, road and river which were vital for the maintenance of all Allied operations in Burma, Imphal with its airfields was a main objective when the Japanese made their thrust towards India in the spring of 1944. There was severe fighting in the surrounding hills and on the outskirts of the plain and the Japanese succeeded in cutting a long section of the Imphal-Kohima road and holding it for over three months. The Fourteenth Army held on grimly, inflicting heavy punishment on the Japanese. 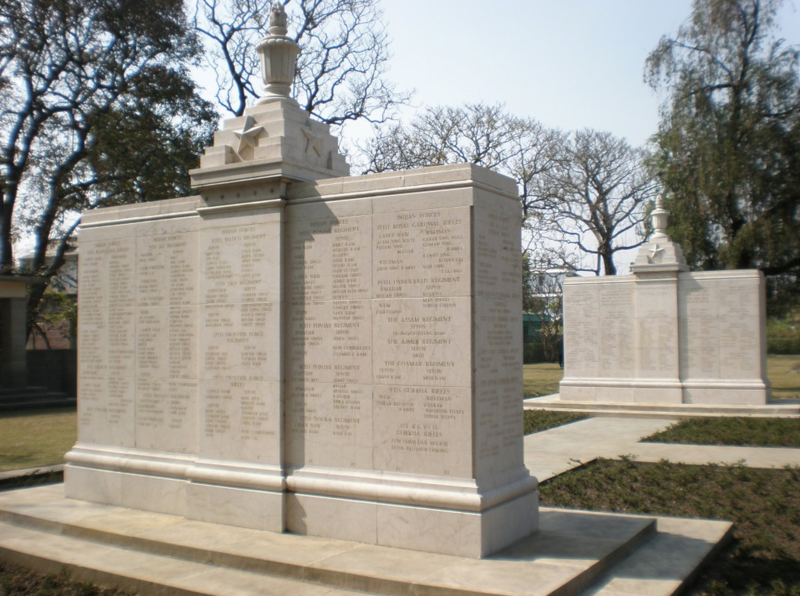 Of all the battles on this frontier of India the siege of Imphal and its relief in the summer of 1944 rank next in importance to the Battle of Kohima. 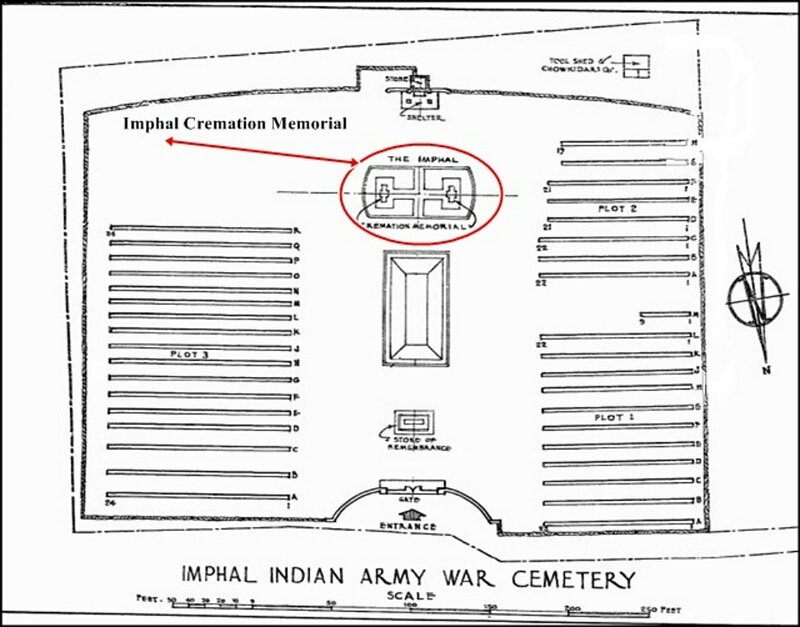 IMPHAL INDIAN ARMY WAR CEMETERY was started during the fighting and later, Muslim graves were brought in from a number of small civil cemeteries in the district. 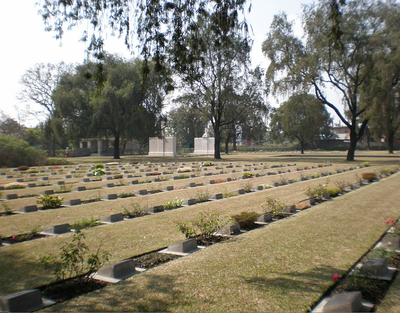 The graves are mostly those of Muslim soldiers of the army of undivided India, but a small number of East and West African soldiers who were Muslims are also buried there. 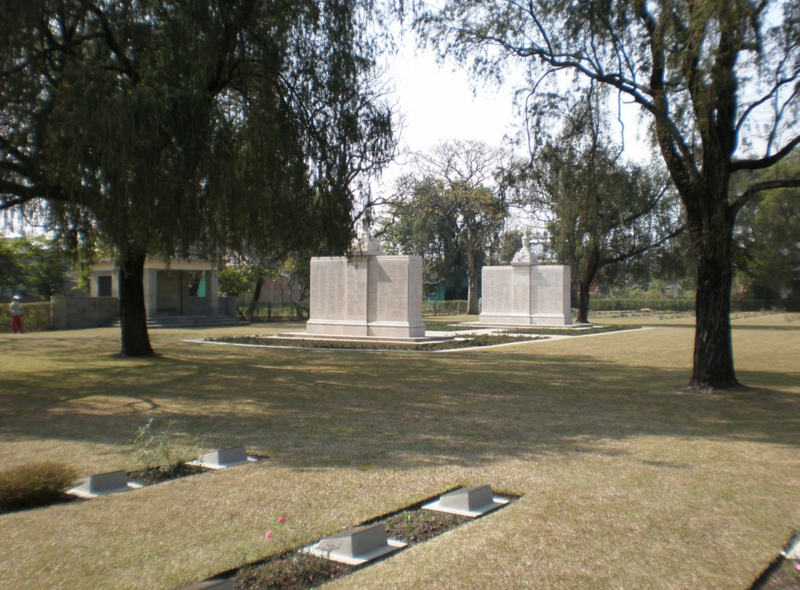 The cemetery now contains 828 Commonwealth burials of the Second World War. ​11460/IO Jemadar Abdul Hafiz, V. C.
3rd Bn. 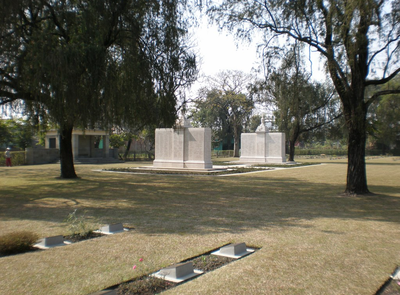 9th Jat Regiment, died 6th April 1944, aged 25. Plot 3. Q. 2. Son of Nur Muhammad and Hamidan; husband of Jigri Begum, of Kalanaur, Rohtak, India. Citation: The following details are given in the London Gazette of 23rd July, 1944:- In Burma on 6th April 1944, 10 miles north of Imphal, the enemy had attacked and occupied a prominent feature. Jemadar Abdul Hafiz was ordered to attack with two sections up a completely bare slope, very steep near the crest. Jemadar Abdul Hafiz so inspired his sections that from the start the attack proceeded with great dash. The enemy opened fire with machine-guns and grenades, causing several casualties, but the assault continued without hesitation up the last few yards of the hill. 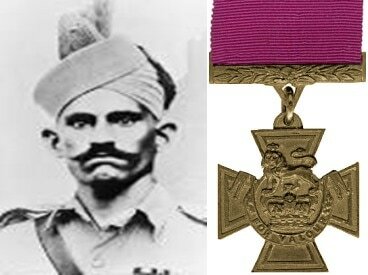 Jemadar Abdul Hafiz was wounded, but seeing a machine-gun firing, he immediately went towards it and, seizing the barrel, pushed it upwards whilst another man killed the gunner. He again advanced, killing several of the enemy, but was badly wounded in the chest. He died shortly afterwards. The inspiring leadership and bravery displayed by Jemadar Abdul Hafiz in spite of having been twice wounded so inspired his men that the position was captured and severe casualties inflicted on the enemy. His complete disregard for his own safety, and his determination to capture and hold the position at all costs, were an example to all ranks. At the southern end of the cemetery stands the IMPHAL CREMATION MEMORIAL which commemorates 868 Hindu and Sikh soldiers and airmen killed in the battle for Imphal whose remains were cremated in accordance with their faith.